Een algemeen zicht op de begraafplaats Westouter Churchyard and Extension. Deze begraafplaats ligt op het kerkhof rond de Sint-Eligiuskerk. Zoals op zo vele begraafplaats is er ook hier een Duitser begraven : Joh. 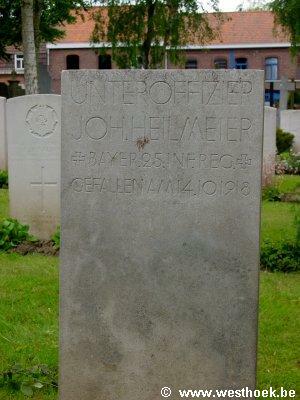 Heilmeier, gesneuveld op 14 oktober 1918, minder dan één maand voor het einde van de oorlog. 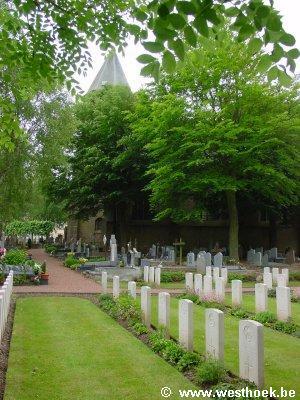 Westoutre Churchyard and Extension is located 12 Km south west of Ieper town centre, on a road leading from the N375 Dikkebusseweg. From Ieper town centre the Dikkebusseweg (N375) is located via Elverdingsestraat, straight over a roundabout onto J.Capronstraat (for 30 metres), then left along M.Fochlaan. Immediately after the train station, the first right hand turning is the Dikkebusseweg. 10 Km along the Dikkebusseweg after passing through the villages of Dikkebus and De Klijte, lies the right hand turning onto the N315 Sulferbergstraat. 2.5 Km along the N315 lies the village of Westoutre. (Now spelt Westouter). The churchyard is located in the centre of the village and the Commission plot is located on the far right hand side of the cemetery after entering the site. 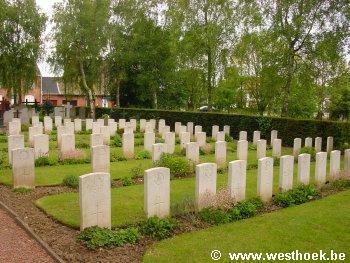 The village of Westoutre remained in British or French hands from the early months of the War to the Armistice; but in the summer of 1918, after the Battles of the Lys, it was within 2.4 kilometres of the front line. 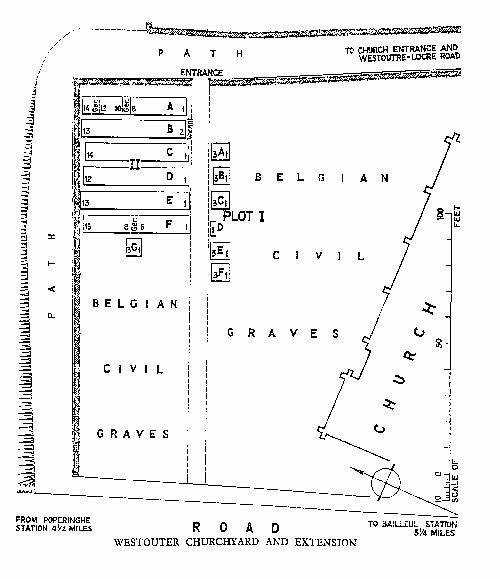 The Churchyard and Extension was used by British Field Ambulances and fighting units at intervals from November, 1914, to September, 1918. There are 98 Commonwealth burials of the 1914-1918 war here, 1 of which is unidentified. There are 3 German Foreign National burials here. The Plots in the Churchyard Extension cover an area of 446 square metres.